Oh my goodness - I cannot believe that Christmas is less than two months away! That is crazy! Since I will have a newborn by then, I am trying to mentally prepare myself for the holidays now. But I'm not sure it's working. Holidays are overwhelming for little ones...all of the celebrations and new toys - while fun - can equal extra sleepiness and tantrums. Hopefully everything will go smoothly, but with two kids under two, I would say it's unlikely we'll get through the season without at least a few meltdowns. 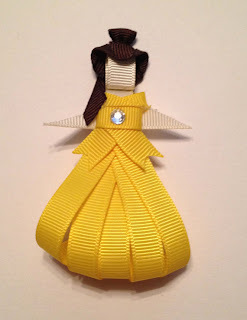 Today I'm thinking about things that would be fun for the little ones to find wrapped up under the Christmas tree. Granted - they are both still going to be so young at Christmas (and they already have so much stuff) that probably most of these things are entirely unnecessary. But half the fun is getting to see the joy on their faces when they open the gifts, right? 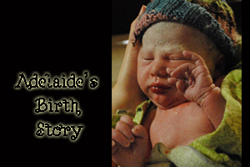 Don't anybody tell me that Adelaide won't be old enough to express joy. I don't want to hear it! So without further ado - a few fun things that I have found scattered about the internet that look like fun for our family! Little People DC Super Friends Batcave Playset. I happen to have it on good authority that this one will be waiting under a tree for Lincoln this year. 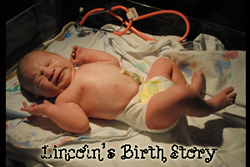 Daddy definitely believes that Lincoln should find Batman to be the most awesome thing ever, so he will be pleased. And hey - Batman is driving a truck so it is sure to be a hit! Little People Batmobile. Because what Batman can live without his nifty Batmobile? Again - it's a car, so would probably be greatly loved. 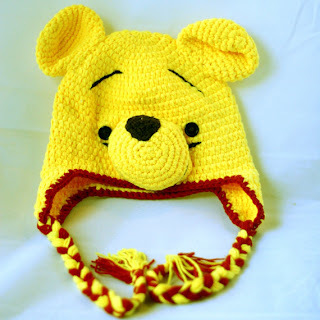 Winnie the Pooh Crochet Hat (by KnitnutbyJL on etsy). I think this is one of the cutest things ever! Lincoln's sock monkey hat (which you can see in photos here) is a huge hit - every time he wears it, he attracts attention and comments from adoring strangers. So Winnie the Pooh would probably have the same effect, right? He is kind of in love with Pooh Bear or "ba" as he calls him - so I think this would make him smile. Dracula BabyLit Board Book. As a former librarian, I find these BabyLit books unbelievably adorable. This one gets the Daddy stamp of approval as well. 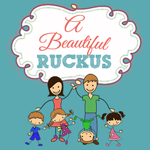 We will probably (eventually) end up with the entire collection of these cute board books! Lightning McQueen Pillow. I wouldn't be a very truthful mama if I didn't admit that Lightning McQueen should probably be represented in some way this holiday season. We already have so many car toys - maybe a pillow would be fun? 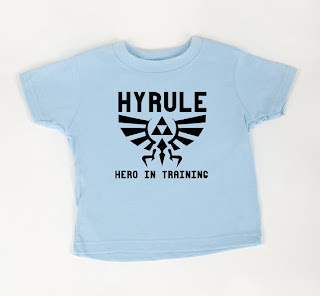 Hyrule Hero Tshirt by geeklingdesigns on etsy. Wardrobe choice by Daddy. 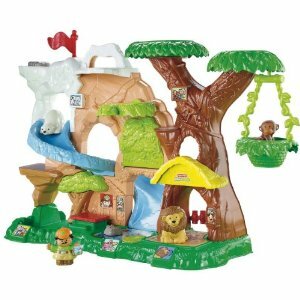 Little People Zoo Talkers Animal Sounds Zoo. This one he will actually be receiving under our tree here at home! I picked up this toy at Target during an amazing sale last year - it retails for $50 but I paid $18 for it, brand new! Since we saved so much on the zoo set itself, we've been able to collect some extra animals throughout the year, so we'll have a big collection of animals and zookeepers to get the zoo off to an awesome start. And yes - we even have a safari truck, so we're covered in the chance he's disappointed it is not a car! 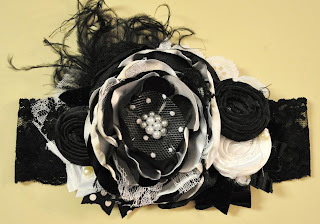 Black & White Headband by Lil' Giggles Couture. I know. What tiny baby needs this many flowers on top of her head? Then again, what tiny baby doesn't need this?! Trumpette Mary Jane Socks. Trumpette is my absolute favorite brand of baby socks. Lincoln has had a few sets, and he wears them pretty much every day. There are far, far too many cute designs for girls and I have been lucky to find quite a few of them while garage-saling and consignment shopping this year. But I never seem to think it's truly enough. These are just precious! Sophie the Giraffe. We didn't have this toy for Lincoln, but I always kind of wanted it. Supposedly every baby loves Sophie! I think she's cute, in addition to being a great teether. 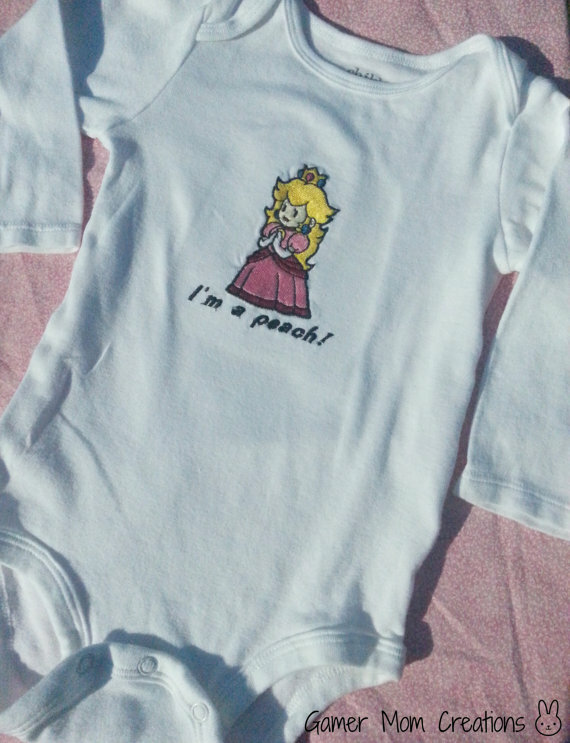 I'm a Peach Onesie by GamerMomCreations on etsy. This is one of those items that I showed to Daddy and he said "have you bought this yet?" Since she will be residing in the Nintendo-theme nursery, it seems appropriate that she have at least some related clothing. 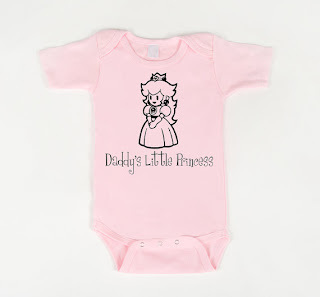 Daddy's Little Princess Onesie by geeklingdesigns on etsy. 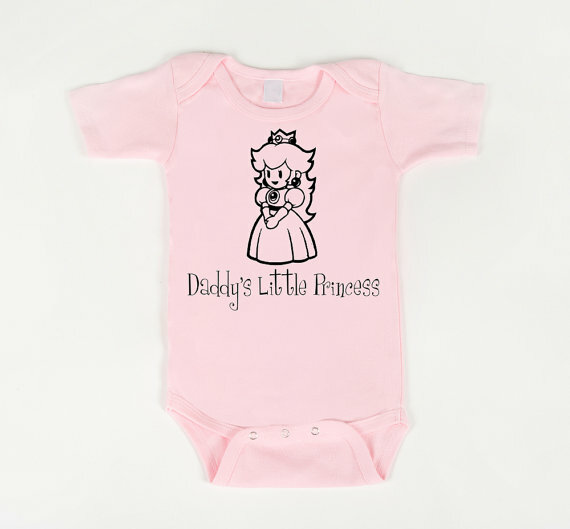 Following on the heels of that last wishlist item - another perfect onesie for Daddy and his princess. 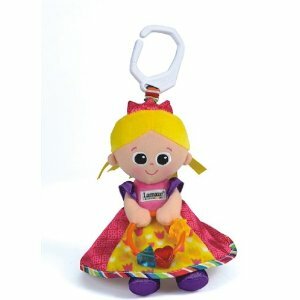 Lamaze Princess Sophie Take-Along Toy. Okay, okay. She really doesn't need this at all. But I've always thought it was adorable. I'm linking up with Growing Up Geeky for Toddle Along Tuesday! What are your kiddos wishing for this holiday season? Who doesn't love Batman!!! Great gifts! I didn't get the whole 'Sophie' thing until Clara started teething - and she didn't have the dexterity to pull traditional teethers up to her mouth, but could pull directly up on say, a finger. I remember thinking 'if only they made teethers that were long and thin enough for a baby to grasp... Sophie!!' And yes, she loved it! 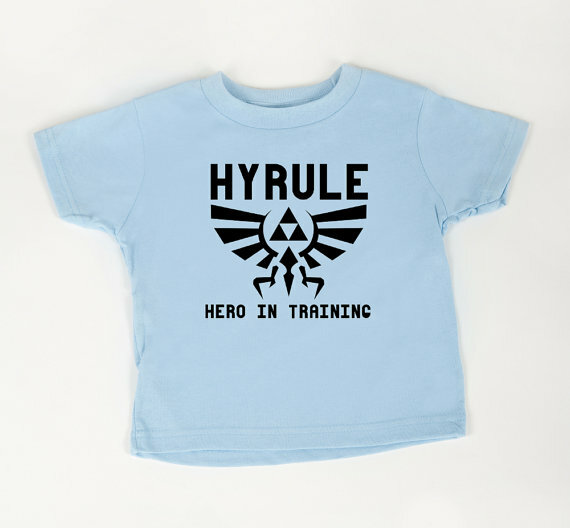 And Geekling Designs is the best! Visiting from the tottle along. I've heard great things about that teether. The headbad and pooh hat are super cute too. I bet my Shirley Temple would love those too.